What if I told you there was a way for you to retrieve your valuable smartphone if it gets lost or stolen, and it wouldn’t cost you a Rupee? Yes, you heard it right, for People who don’t like spending on securing their mobile smart phones from theft then truly it’s a smart idea and to fulfill this smart idea here comes the security solution from none other than F-Secure. F Secure, the antivirus and security solution provider giant has come up recently with its free offering of “Anti-theft” suite.This free offering from F-Secure allows users to lock, wipe or even locate the mobile phones remotely even after mobile gets lost. If you suspect your phone to be missing you can remotely lock it or wipe the data so that your private text messages and pictures don’t end up in the wrong hands. You can also locate your phone or the person holding it remotely. 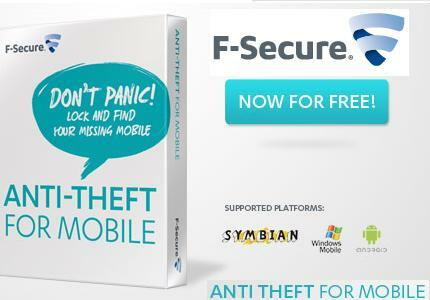 All you need to do is, first download the Anti-theft for mobile suite from f-secure.com from PC or you can also download this suite from mobile web from “F-Secure.mobi” and install this software in your smart phone. After installing, it’s just a cake walk for configuring your mobile against Mobile theft. Open the installed suite, go to Anti-theft settings, enter the trusted mobile number where you wish to receive the alerts when sim is changed and also select your desired security code so that with this security code you can wipe, lock or locate the data remotely and there you are, you have successfully configured your mobile against Anti-theft currently, this software is available for Symbian, Android and also for Windows Mobile platform. According to me, this application is worth a try as it gives access to do things remotely i.e to wipe, to lock or even to locate. Is this a trial pack offer?